What comes around goes around. And around. And around. Stock cars prove it at West Havens Devils Bowl every Sunday all summer. just dicing it out, wheel-to-wheel. Theres no other action close to that. Thats why auto racing is now the number-one fan sport. They have more people at the Daytona 500 than they have at the Superbowl. In fact, a recent survey of attendance at American sporting events found that 17 of the 20 largest crowds were gathered for stock car races. Essentially a blue-collar pastime, the fossil-fueled sport was born in the Carolinas during Prohibition, when moonshine runners would soup up their engines to try and outrun lawmen in the dead of night. The best drivers began competing on dirt tracks carved out of cornfields. But stock car racing really came into its own after World War II, when returning soldiers with the right stuff had time on their hands and money in their pockets. Today, wannabe Win-ston Cup winners from as far away as Canada and New Jersey work their way up the ranks at Vermont proving grounds such as Bear Ridge in Bradford, Thunder Road in Barre and the half-mile dirt loop at Devils Bowl. Her father, C.J. Richards, built the Fairmont Speedway in Fair Haven in 1965. He stayed two years while building Devils Bowl in nearby West Haven. Twenty years later, the family opened a sister track, the Albany-Saratoga Speedway, in Malta, New York. As a girl, she remembers sleeping behind the booth while her mother, Judith Richards, sold tickets. Sharon took over her mothers full-time management position after Judith died of cancer in 1997. Many of the motorheads who provide the entertainment at Devils Bowl are locals with nicknames like Hollywood Joe Santoro or the Flying Farmer, a.k.a. Gene Munger of Benson. 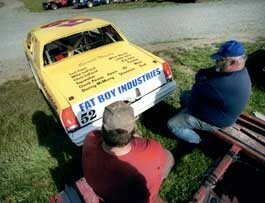 Carl Super CV Vladyka lives on a farm next door to the now-defunct Fairmont speedway in Fair Haven. Nowadays, the third-generation dairy farmer drives a high-performance 2002 Monte Carlo in the Pro Street Stock division. During the week, when hes not milking Holsteins, he and his mechanic tinker with the rig, redistributing weight between the wheels, changing tire sizes or tweaking the gearing so the car will take corners more or less tightly. On any given Sunday, four classes of car vie for vehicular victory beneath the stadium lights. The higher the class, the more powerful the motor. At the top of the heap is the Modified Car, an open-wheeled racer. The earliest ones were fenderless Gremlins. One notch down from the modified car is the Pro-Street Stock car, which looks like something youd see on the highway, but each with a custom-built chassis, a light fiberglass body and high-performance parts. The Hobby Stock car, one more step down, must use parts originally made for that vehicle, with few exceptions. You take it out of the junkyard, put a roll cage in it, a stock motor for the year of the car and stock tires, Richards explains. Winners in these racing categories can collect cash purses of several hundred dollars. But in the entry-level cruiser division, learning drivers maneuver 4- and 6-cylinder compacts for nothing more than glory and good vibes. In a single outing to Devils Bowl, spectators can expect to see about 17 races, ranging from eight-lap qualifying rounds with about 10 cars per heat to features, in which up to 25 cars at a time complete 20 to 100 laps. What is it  besides hot dogs, beer and Americans perennial fascination with the automobile  that keeps folks coming back to Devils Bowl each Sunday? Probably not the opportunity for scintillating conversation. The noise level at this place rivals an airport runway. Its probably not the fresh air, either. Though races dont start until after the evening dew has settled down the dust, and groomers prepare the surface of the track with 250,000 gallons of water on the driest summer nights, spectators are well-advised to wear goggles. People have broken bones at Devils Bowl, but there has never been a fatality. Roll cages and five-point harnesses, like the ones used in child seats, allow drivers to walk away from most acci-dents  even ones that look devastating.